Tenerife has lingered on your wish list for a long time. Too long. The largest of the Canary Islands is home to the highest point in Spain. Volcanic Mount Teide could erupt at any time. Rugged mountains, deep ravines, lava tubes, and vineyards extend to the coast. Where steep cliffs don’t drop into the ocean, it’s lined with both white- and black-sand beaches. The island also receives 300 days of sunshine every year. So what’s the problem? The Island of Eternal Spring is popular. Too popular. It’s not only the most-visited of the seven Canary Islands, but it’s also one of the biggest tourist destinations in Spain. More than 10 million visitors arrive each year. Most of them are Brits and Germans. Many of them stay at cheap all-inclusive resorts. You just couldn’t find your spot on Tenerife. Luckily, there’s a new spot on the island. Royal Hideaway Corales Beach opened about a year ago. It’s on Costa Adeje, the southwestern coast of the island where many of the higher-end resorts are located. It’s in La Caleta, a quiet fishing village that feels far removed from the crowds. It sits above Playa de la Caleta, a lava-rock beach nestled between cliffs. While it overlooks cacti, palm trees, gentle waves, and, eventually, the vast Atlantic. From a distance, the hillside resort looks like an ocean liner. Its Spanish architect created the striking, white-washed building in between Teide National Park’s mountains and the black-sand beach. It has open-air corridors, lots of glass, sunken decks, and a rooftop pool. Then the British interior designer got to work. The reception area was inspired by the island’s caves. The spa has open-air cabins. While communal spots look like they were carved out of coral. That aquatic theme continues into the junior suites. 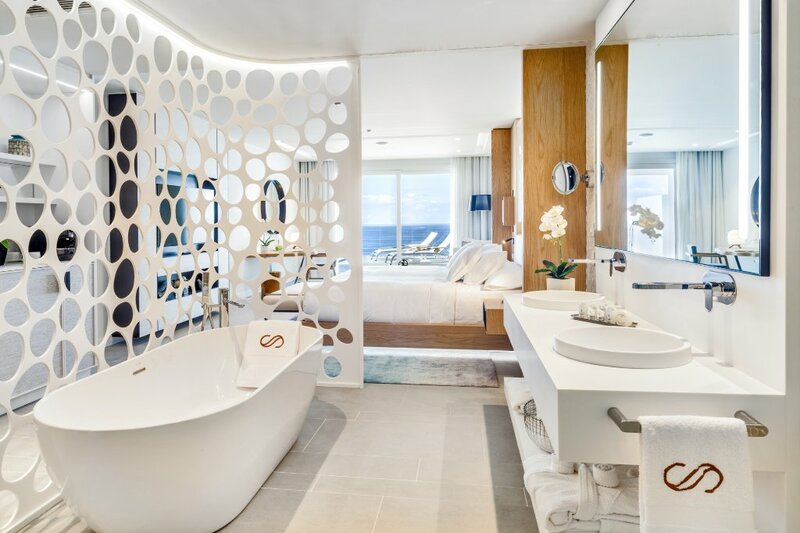 A see-through wall, which seems like holes in hard coral, separates the open-plan bathroom from the mostly white bedroom. A freestanding bathtub, a separate shower, and toiletries from the White Company are partially hidden behind that wall. There’s a large, comfy bed on the other side of it. But your eyes are immediately drawn to the floor-to-ceiling windows at the other end of the room. Sliding-glass doors open onto a huge balcony. Since you upgraded, there’s a hot tub in the corner near the sun loungers. Between the hot tub and the promise of a stunning sunset, you usually wouldn’t go very far on your first night. You’d probably order room service, add a bottle of local Malvasia wine, and spend the rest of the evening on the balcony. But that’s hard to do with so many gorgeous spots at the resort. 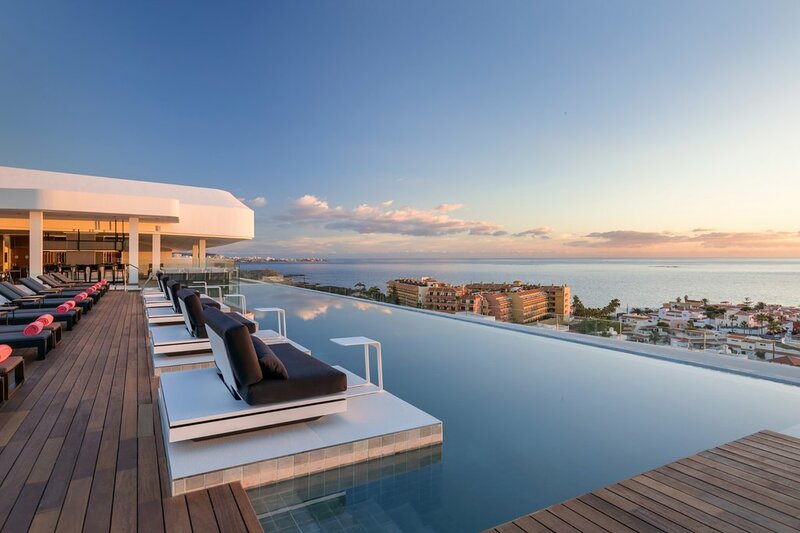 There’s a saltwater infinity pool on the roof. Maresía the Roof serves cocktails next to it. There’s San Hô, a Nikkei restaurant that prepares Peruvian ingredients through a Japanese lens. There’s also Maresía Gastro Space, a laboratory-style kitchen helmed by the Michelin-starred Padrón brothers. Room service will have to wait until breakfast. While Tenerife can no longer wait at all.